“The China Study” claims to prove that animal products are bad. However, it appears to prove exactly the opposite. The groups that ate more meat lived longer. “The China Study,” by T. Colin Campbell, is the bible of veganism. It is a huge book which covers a lot of ground and makes many valuable points. The name of the book comes from a series of observational studies done in 69 counties in China called the China-Oxford-Cornell Project. Dr. Campbell himself led two of these studies. 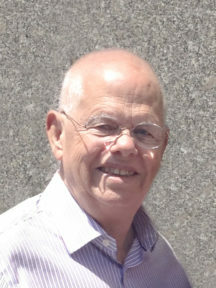 From this project, he concludes that “plant-based foods are beneficial, and animal-based foods are not”. We found on-line data for the 1989 study and attempted to verify this conclusion. 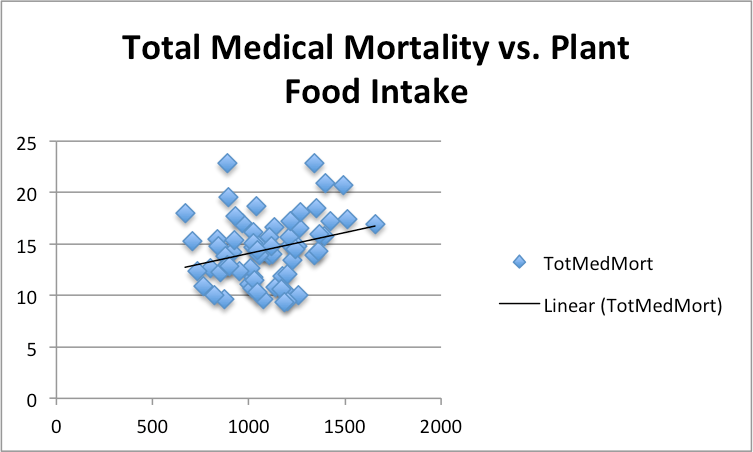 We looked at all-cause medical mortality (doesn’t count accidental deaths) versus dietary choices. There are several reasons for using all-cause medical mortality versus specific diseases, such as cancer or heart disease. First, there is general agreement on the diagnosis (dead! ), and second, a dietary item that decreases one specific disease is of limited interest if it increases another. The first thing we looked at was red meat consumption. Surprisingly, the study showed that people who consumed more red meat had lower mortality. Well actually, this didn’t surprise us. The surprise is that data like this could somehow be used to support a vegan lifestyle. How is this going to work? Ours was not an elaborate data analysis, the sort that might be subject to cherry picking or data mining. We did a simple scatter plot of red meat consumption versus all-cause medical mortality for the 67 counties in the study that reported this and observed the trend. Red meat was clearly beneficial. 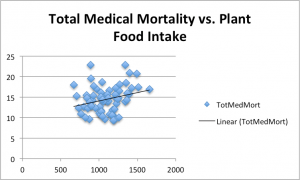 The more eaten, the lower the mortality. After this unexpected start, we tried a variety of other foodstuffs. The results are a pretty far cry from any sort of conclusion that meat products are bad and vegetable good. Here’s a list of all the animal and plant categories found in the study. 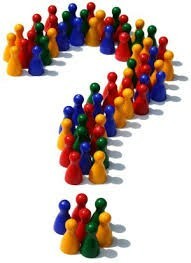 What conclusion can be reached here? Eat any animal product you want except milk. Eat fruits, nuts, green vegetables, rice, and legumes, but avoid wheat, other cereals, and light colored vegetables. Here are two scatter plots. 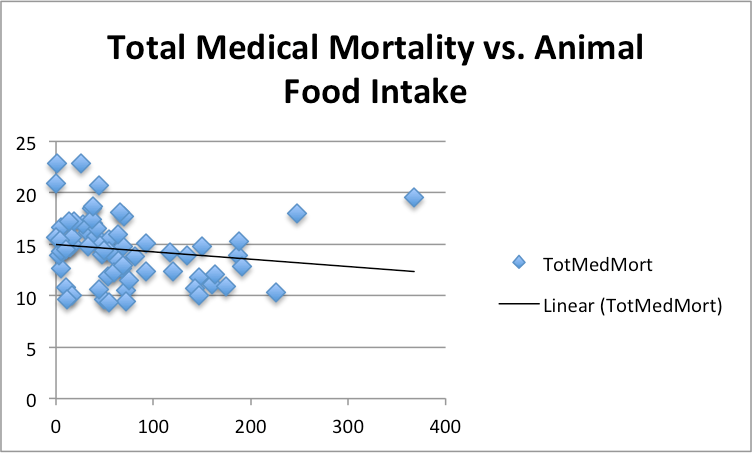 One expresses all medical cause mortality vs. plant food intake, and the other all medical cause mortality versus animal food intake. First, here’s what happened to people based on the amount of meat they ate. The horizontal axis is average grams per day. The vertical axis is deaths per 1000 per year. Now of course other factors are at work, they always are, but the trends are perfectly clear. People that ate animal food lived longer, plant food shorter. Plant food isn’t best for you, animal food is. Now this is a simple trend line, about the easiest way to look at data. We have no doubt that a talented data juggler, armed with a sufficiently complicated stat package could somehow prove animal product was bad for you. This is a sort of magic that statistics does better than alchemy. But “The China Study” doesn’t even attempt to do any statistical gymnastics with obviously conflicting data. It just ignores it. We don’t want to be too picky, but the results would suggest that our proposed diet guidelines are better than any vegan fare. We could even reasonably make a claim that the China-Oxford-Cornell Project ‘proves’ our own diet is best. The results for animal product were amazingly consistent. Except for milk, eating animal products lowered mortality – period. We do not claim these results actually ‘prove’ meat is better for you than vegetables, though that is clearly what we believe, and clearly what the data seems to indicate. But there were confounding variables. Meat eaters probably had more money and there were no doubt other factors. However, to claim this data proves animal products are bad for you is absurd. The raw data strongly contradicts any such notion. This is not very good news for vegans and we would strongly suggest they consider the potential consequences of their diet and add lacto/ovo items. There seems to be a lot of attention paid these days to sustainable and humanely treated animal products and well there should be. 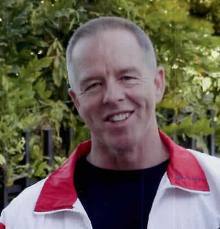 It turns out that there is a rather heated Internet controversy about the validity of “The China Study.” There is material by both Dr. Chris Masterjohn and by Denise Minger which appear to reach similar conclusions to ours, specifically that the assertions Dr. Campbell makes based on the China-Oxford-Cornell Project data do not appear to be supported by the data itself. Interestingly, the China-Oxford-Cornell Project counties with the highest blood cholesterol level also had the lowest mortality. Read that sentence again. How about that one? Want to do your own research? You can download China Study project files from here, or email us and we will send you our much friendlier excel spread sheet that we created from the 1989 study data. One final thought: our experience over several decades has made us a bit skeptical about any food-diary based claims. Reasonable food types as food questionnaire categories become conflated, for example processed meats get lumped in with ‘meat’ though we now know that plain meat has a much better health effect; goat, cow and sheep milk gets lumped together; cheese is categorized with non-pasteurized milk- Brucellosis from rural Chinese cows anyone? – and so on, not to mention the new understanding that memory based food-diaries are less reliable than once thought. So, for us, the net-net is we don’t place a lot of credence in any of the China study data, but whatever credence it deserves it is clearly not that it supports a vegan diet. Thankyou for such compact and perhaps interesting conclusion. Didn’t had to use the link, because trust the authors implicitly. Also time saving. So, as they say ‘the devil is in the detail’, here are the details, let’s look at some of them. Green Veg., Fruit, Nuts, Eggs – yes, yes, yes, yes. Red Meat – yes, but in moderation, not forgetting, that one portion should be the size containing the required amount of DAILY protein intake and NOT WEEKLY !! Also, not more then couple of times a week, because there is other acceptable food ready to be eaten – Poultry and Fish – to complete the week. And all meals, of course, with green vegetable. Only personal comments, proven by lifetime experience. Nuts are must. There was a short article in the paper, suggesting that almonds will enhance female’s face features, if eaten daily (tested by scientists). But they didn’t say how much daily. What? A kilo a day?! Then there was another one – eating fresh blueberries is good for face and for the best affect – 300 g a day. But this is a staggering 9 kg a month! I tried, but only managed 150 g two, or three times a week. And this was when the blueberries were in season. But to exclude the milk completely causing me a serious concern. How could we exclude it when it was beyond our control? How this could be achieved if we are all survived and grow on milk since we were born – mothers’ breast milk! Forgotten?! My mother told me that I had it every day and plenty. And as soon as I learned how to walk, here I was , taken by my father and by a very busy mother (Deputy Head Master) to her parent’s farm, where everything was there for me: The Animal Meat, The Poultry, The Eggs, and you guess – Fresh Milk! When my grandmother used to bring a huge bucket of still warm and steamy milk – here I was, ready with my mug, dipping into the bucket! That’s how I remember part of my childhood. In my adult life I was a witness of something really horrible and I would call it my own ‘case study’. test (FPG) 2: Oral glucose tolerance test (OGTT). OK China Study is crap. But what about Legumes? I can’t find anything on this site or in the book.